Stomach Botox for Weight Loss? Gastric injections of botulinum toxin A (BTA) can delay gastric emptying but do not make obese individuals feel more full, alter their eating behaviors, or cause them to lose weight, according to the February issue of Clinical Gastroenterology and Hepatology. In attempts to help people lose weight, researchers have tested ways to slow gastric emptying (movement of food from the stomach to the small intestine) and increase satiation (feeling full). 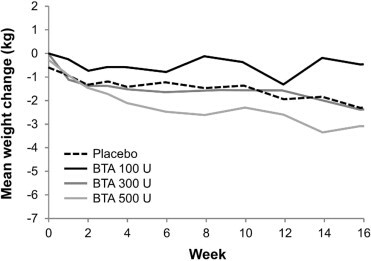 Gastric injections of BTA have been reported to delay gastric emptying, increase satiation, and reduce body weight, but with inconsistent results. Botulinum toxin—a protein and neurotoxin produced by the bacterium Clostridium botulinum—reduces muscle activity by blocking the release of acetylcholine from neurons. Mark Topazian et al. compared the effects of injecting different doses of BTA into the stomachs of 60 individuals with mild-to-moderate obesity. Study participants were each given 1 injection of BTA (100, 300, or 500 U), or placebo, in the gastric antral muscularis propria, guided by endoscopic ultrasound. Gastric emptying of solids was measured by scintigraphy. Topazian et al. also measured participants’ body weights every 2 weeks, along with satiation (based on maximum tolerated volume in a caloric liquid drink test), calorie intake (based on a questionnaire), gastrointestinal symptoms, and psychological aspects of eating. Two weeks after the injections, the mean half-time for gastric emptying of solids increased by 0.8, 14, 24, and 14 minutes among subjects given placebo, 100, 300, or 500 U BTA, respectively. Sixteen weeks after the injections, mean body weights were reduced by 2.2, 0.2, 2.3, and 3.0 kg in these groups, respectively—not a statistically significant difference (see below figure). Nor were there significant differences among groups in satiation volume, caloric intake, gastrointestinal symptoms, or psychological aspects of eating among groups. So, although stomach injection of BTA slows gastric emptying, it does not increase the feeling of fullness or lead to loss of body weight. The authors say is unlikely that higher doses of BTA than those tested would induce additional delays in gastric emptying or weight loss. Previous studies have associated gastrointestinal symptoms with eating behaviors. Topazian et al. did observe that a higher maximum tolerated volume, a physiological measure of satiation, correlated with less control over eating. They propose that educating obese patients about physiological differences in stomach volume might help them improve their ability to control how much they eat. Topazian M, Camilleri M, Enders FT, et al. Gastric antral injections of botulinum toxin delay gastric emptying but do not reduce body weight. Clin Gastroenterol Hepatol 2013;11: 145-150.e1. This entry was posted in GI Tract, Technology and tagged botox, BTA, fullness, gastric emptying, medical, obeisty, overeating, satiation, therapy, treatment, Weight Loss. Bookmark the permalink. 9 Responses to Stomach Botox for Weight Loss? I was looking for this type of toxin for my friend. She is very fat, it will definitely help her. Thanks for sharing this post, i will refer her. I used too be recommended thiks bpog by means of my cousin. Is injection of BTA are safe? May be Denise Austin yoga for growing thin would be also suitable? Toxin is the waste material of the body, which needed to come out from the body otherwise its increase the Fat in Body. Generating chosen to reduce those people excess fat needed to java a handful of targets might be obtainable. Situation any targets serves to executing remedial actions must you be a failure the second. Feature rooms that are small servings Personalized food consumption 3 or more spacious servings each and every day so that you can dine on on a normal schedule later in the day.